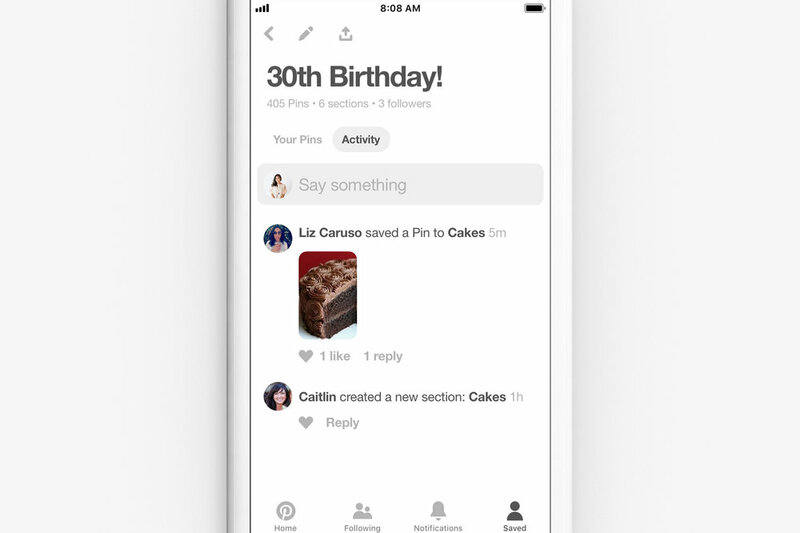 Pinterest is introducing new collaboration tools that make it even easier to plan parties and projects on Pinterest. Launching on group boards, now you can have conversations with the other members of your board with the new group activity feed. The activity feed helps you keep track of what’s happening on the board, like when someone saves a new Pin or adds a new section, or a new member joins. Having a conversation about a specific Pin is also more seamless than before. You can weigh in with a quick “like” or comment, @-mention a collaborator or reply to start a new thread. Only members of the group can see your conversations. The majority of Pinners use group boards to collaborate with family and friends as they plan parties, events and projects together. These updates are in direct response to requests from Pinners just like these, and they’re part of our ongoing effort to make Pinterest a more productive place to bring events and other projects to life. These updates are available starting today across all platforms—mobile and web.